If you are using Office 2007, make sure you install Service Pack2 update to add loads of new features and improvements [discussed here]. We have already seen an alternative to save Office 2007 documents as PDF / XPS files by installing Office Add-on for the same. If you install Office 2007 SP2, then this feature will be added by default (no need of an add-on!). After you install Office 2007 SP2, create any document and then click on save as option. You will see 2 new options: Open Document Text and PDF / XPS. 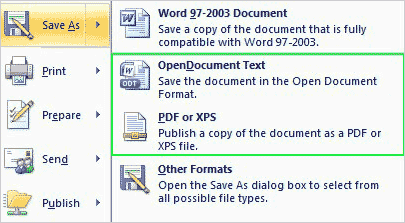 In simpler terms, now you can create and save any Word 2007 document as PDF / XPS or open document format. Download Office 2007 SP2 [via].